Since 1981, Bard College in Annandale on Hudson, NY, has had a unique summer course, mandatory for all incoming students, called “Language and Thinking.” After joining the Bard network in 2011, Bard College Berlin came to adopt the Bard concept in 2013 and so this year’s freshmen were the first ones to experience the program as put into practice by professors James Harker, Matthias Hurst and Ulrike Wagner. For three weeks, students had to read and think, but mostly write a lot. Most of the writing tasks demanded and focused heavily on creativity. Thus the first-years came to realize that the aim of L&T––to create a smooth transition to college education––is pursued not by mimicking the exact format of university-level courses, but rather through a somewhat different and more openly-creative class structure. The Bard Berlin program was very similar to the program at Bard College, says James Harker, the coordinator of the Bard College Berlin L&T program. We used many of the same readings, techniques, and assignments. One difference, though, is that L&T at Bard Berlin was taught by regular members of the faculty. At Bard, mostly guests from elsewhere come to campus to teach L&T. This might produce some differences. The Bard L&T faculty bring in a variety of perspectives and styles. The Bard Berlin L&T faculty, however, might tend to shape the L&T experience so that it fits with the first year experience a bit more. The purpose of the program is to help students read and write better, and thus to prepare them for the academic work to come. 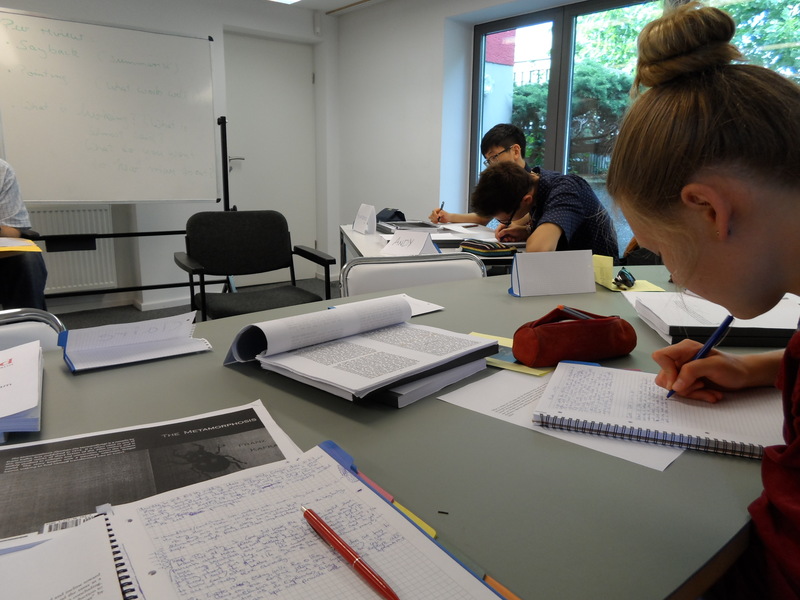 Although the writing that the L&T participants did was quite different from the one that students would be required to do at Bard College Berlin or any other college, the methods used to encourage students in their writing were constructed so that they would enhance their writing skills overall, regardless of the writing format. The aim of the exercises used during the L&T is to make students think about texts and their interpretation, about the process of reading and understanding, and about responding to texts in written form. This goes hand in hand with the reflection upon one’s writing and the power of one’s use of language. The L&T classes are mostly concentrated on interpreting a text or some different sources, and on working on the given input and topics in various ways. The materials that the class worked with, for example, were poems, excerpts from books, manifestos or essays, as well as visual media like photographs, paintings, films, and objects of conceptual art. The main themes connecting all those different sources were freedom, humanity, identity, and transformation. The exploration of these subjects was largely supported by the two classic works that the students had to read over the summer prior to the program’s start – Kafka’s Metamorphosis and Sophocles’ Antigone. This structure enabled the program’s aim to teach students how to work with and bring together different ideas. The goal is to show how to understand texts or topics in a comprehensive, interrelated way and to encourage everyone to find his/her voice, to discover possibilities of creative and meaningful writing, to feel both competent and relaxed while reading and writing, to understand (to a certain degree), and to use language as a tool for expressing thoughts and opinions, says Matthias Hurst, one of the three L&T seminar leaders. The tasks were challenging in that they required a creative approach that was probably completely new to most of the students. By being constantly provoked to find connections between works of art that at first looked like they had nothing in common, the L&T participants learned to think of such objects in an interrelated way. They were also required to use language in a novel way, as in writing a piece within the style of a text they had just read. It is not a coincidence that the topic of the very first L&T program was Freedom and Constraint, points out Benjámin Sivó, a first-year BA student from Hungary. Through the various kinds of prompts and tasks, we were able to release our imagination and create the sort of product we wanted without any constraints. I have never experienced such an inspiring intellectual environment in a class before. It was a playground of exchanging exciting ideas; there was no room for intolerance or lethargy. The fuel for these creative ‘brainstormings’, discussions, and individual works came from a range of wisely selected relevant sources such as poems, essays, pieces of music, artworks and movies, adds Benjámin. The L&T program is not so much about assessing and grading your written work, explains Matthias Hurst. One does not write for a professor to finally get a grade; one writes for oneself to experiment with language, to exercise writing skills, to revisit and revise older texts into better texts, and to test one’s own ability to handle, operate and master language and styles of writing. Furthermore, by leaving the writing completely to the students and allowing possible feedback to be provided solely by their peers, the L&T instructors distanced themselves from the writing process and thus provided the students with an open playground where they could start having fun with their writing and share the activity with the others. We tend to treat writing as solitary, difficult, something we’re self-conscious about, and something we avoid until the last minute, explains James. L&T intends to reverse these associations by making writing social, peer-supported, fun, and very much a regular activity. Students who have participated in the L&T program will likely feel that they are in the habit of writing and that they are less afraid of sharing their writing with others. Some of the tasks did not even necessarily include writing, though. The students were invited, for instance, to sketch or offer different interpretations of what they imagined to be a follow-up of a scene described in one of the texts. Those would always be prepared in groups. Many of the tasks that were individual would also end up being group activities, though. With feedback from their fellows, the students would be reminded of the subjectivity of an individual’s perception and interpretation, for example when their questions would be interpreted in a different sense from the one intended. This helped the students consider their ideas in a broader perspective prior to presenting them, in order to clearly communicate what they really meant. We try to build new routes for self-expression, points out James. The transition from high school to college is anything but smooth. It’s full of new, sometimes exciting, sometimes alienating experiences, both academically and personally. L&T’s format is one of many new experiences. It’s not the same as high school or college classes, it’s not familiar, and it’s not intended to be. Maybe partly because of those alienating experiences, there were some students who did not feel particularly enthusiastic about the program. What those students mostly complained about was the amount of “free writing” – at least three times a day they would be asked to write what spontaneously came to their minds in the span of five minutes. It was interesting to listen to them outside of class telling one another that some of the things they have been writing probably made no sense at all. The only downside that students unanimously pointed to was the packed schedule. For example, there was a day when the L&T workshops, which started at 9 a.m., were directly followed by an orientation, a guided visit to the city centre, and a dinner in a restaurant downtown. Whereas the majority of the students was very grateful for all this being provided by the instructors, staff, and older students alike, they agreed that it was rather inconvenient that they got back late in the evening and only then could start with the reading assignment for the following day. Hopefully, those who did not particularly enjoy the L&T will come to appreciate its benefits eventually, just like Marissa Shadburn, a Bard junior currently spending a semester at Bard College Berlin, does: I really appreciated the L&T. There were definitely times when I hated the free writing and wished I could get back to summer, she says. But in retrospect, the environment L&T creates helped me smoothly assimilate into college by making comfortable social situations in which to kindle friendships and form communities. Some of my closest friends at Bard today are the ones that I made during L&T. L&T made me feel like a Bard student. Duncan Routh, a Bard freshman spending his first year at Bard College Berlin, has a positive experience similar to Marissa’s: I very much enjoyed the L&T program, which I saw as an important transition into Bard College Berlin. It gave us a chance to settle in, to get to know the campus and our classmates before the start of the first semester. The writing exercises that we did in the L&T sessions helped to reawaken my thought processes after a long summer. They trained me to organize my thoughts and to write quickly but efficiently, which has been and will continue to be an essential element of remaining productive. I am very glad to have been able to participate in “Language and Thinking” here in Berlin. Indeed, apart from training one’s writing skills and enhancing one’s creativity, an important aspect of the L&T program is that incoming students meet and get to spend time together before the actual classes start, as well as get acquainted with the environment and the way the university works. Apart from the L&T workshops, the three weeks were also packed with orientation sessions and outings, such as sightseeing tours, museum visits, dinners in the city, movie screenings, picnics or sport events. As a result, when the semester started, freshmen coming from four continents had already taken care of everything they needed for their life in Berlin and at Bard College Berlin, and thanks to the bonds created during that time, hopefully, also felt a little bit more at home here. I liked that we got to meet one another before the official semester because it helped me feel at home by the time the L&T ended. It was my first time in Germany, but thanks to the program the big transition went seamlessly, shares Hyunseong Lee from South Korea. And what were the impressions of the seminar leaders? It was a very interesting and rewarding experience, indeed different from “ordinary teaching.” It was intense, and sometimes it was hard to resist the urge to start discussing a text or an opinion in class. But I also learned a lot about my relation to different texts and about my own writing, thus L&T is not just a program for students at the beginning of their academic career, but also a program for everybody who uses language and texts regularly, a reminder of the power and magic of language and the possibilities we have using this power in a skillful and committed way, shares Matthias his experience with the sort of teaching that the L&T demanded. In general, it looks like the first edition of the program went well. I think the program was successful, concludes James. I noticed that many students opened up over the course of the three weeks and wrote more…and more experimentally!